Fresh eggs from backyard chickens are a treat for sure. Their golden, almost orange yolks sit a little higher than their grocery store counterparts. However, those newly gathered eggs are not your friend when it comes to hard boiling them. The reason for this comes down to basic science. 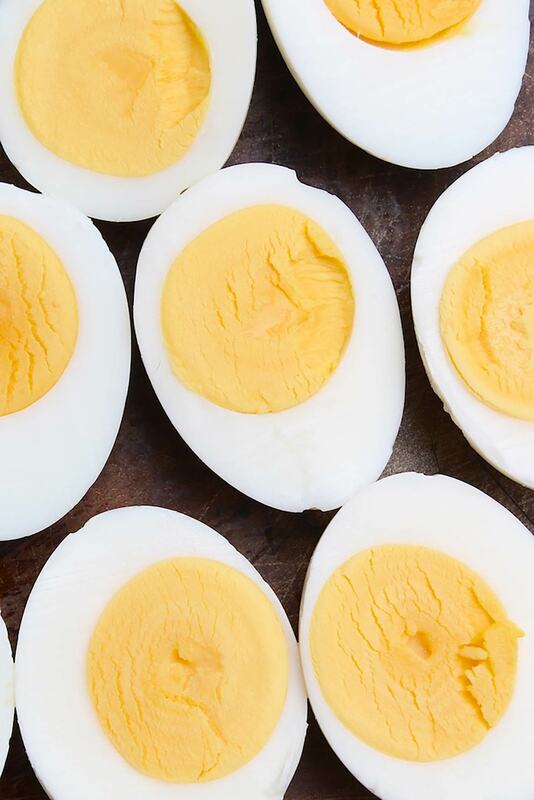 A fresh egg has a low pH (meaning that it’s acidic), and that causes the proteins in the white to bind to the keratin in the membrane during the cooking process. That, in turn, makes it nearly impossible to remove the shell without pieces of the white sticking to it. But as the egg ages, carbon dioxide (which is a weak acid) exits the egg through the pores in the shell. As this happens, the pH of the white increases, making it less acidic. When the alkalinity increases, the keratin softens, creating a looser bond between the white and the membrane. Also, the egg white shrinks over time, so the air space between the eggshell and the membrane grows larger. The end result? Easier peeling. Place the eggs in a single layer in a saucepan, and cover with 1-2 inches of cold water. (I cover with about 1 inch of water when using 6 eggs or less and 1.5-2 inches when cooking 7-12 eggs.) Bring to a full rolling boil over high heat (uncovered), and then cover the pan and remove from the heat. Allow the covered pan to sit for 10 minutes (set a timer) and then strain the water from the pan and run cold water over the eggs. Alternatively, remove the eggs to an ice bath with a slotted spoon. 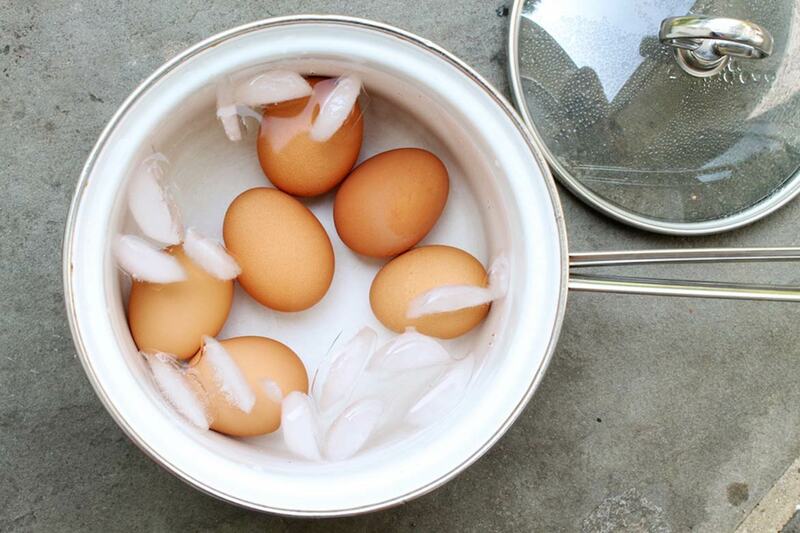 Chill until the eggs are cool enough to handle, and then peel them. I like to use running water to help with the peeling. Small differences will occur based on size of eggs, pot dimensions, and individual stoves, but this method has proved quite reliable for me over the years. Feel free to test one egg a minute or two early until you know the precise number of minutes that will result in the perfect egg for you. Fresh eggs can be very difficult to peel. Use older eggs when possible. If you are having difficulty peeling the eggs, crack the shells as if you were going to peel them and then soak them in water for a little while. This allows water to seep between the egg and the shell and will likely make the job easier. Starting with the eggs in cold water and bringing to a boil (as opposed to adding the eggs to already boiling water) will help prevent cracking. Some say that adding a teaspoon of vinegar to the water prevents the whites from running out of the egg if it cracks while boiling. Also, I often add a 1/2 teaspoon of salt to the water as this is thought to deter cracking and make peeling easier. The harmless green ring that sometimes appears around the yolk is a result of overcooking or cooking at too high a temperature. Keeping the water at a gentle simmer—or following the instructions above—should eliminate this. 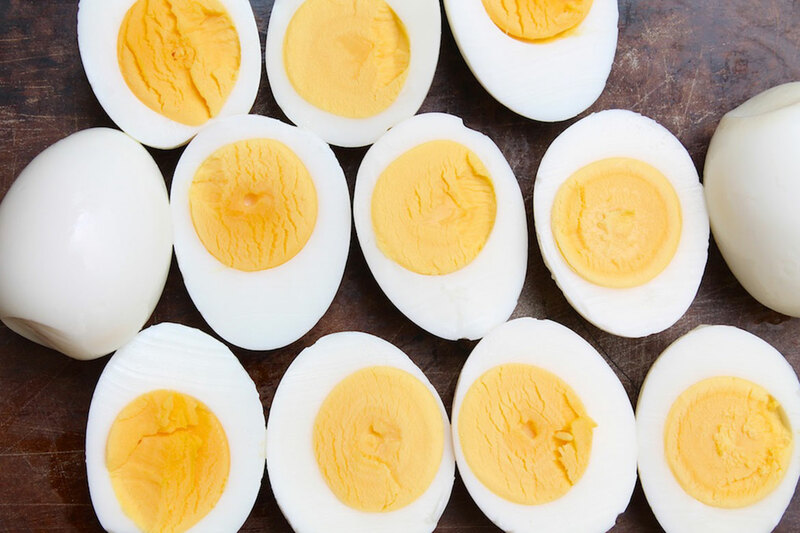 Get your timer out and follow this simple technique for creamy, tender hard boiled eggs every time. 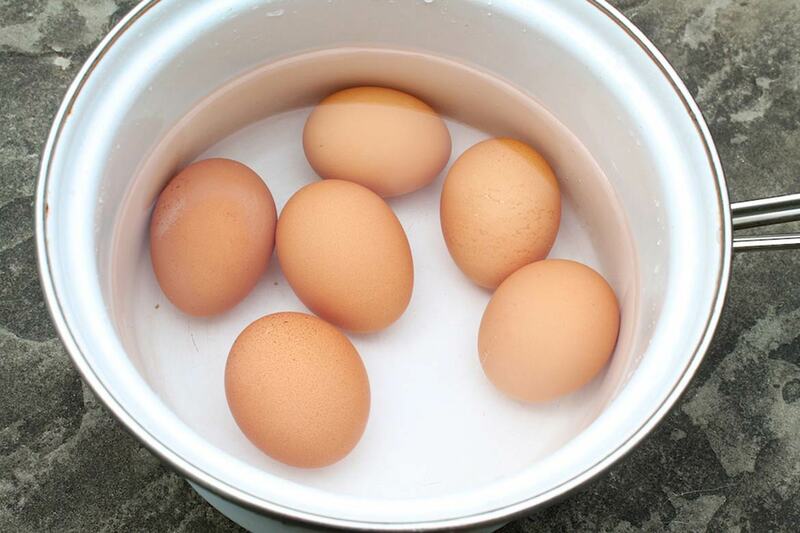 Place the eggs in a single layer in a saucepan, and cover with an inch or so of cold water. Bring to a full rolling boil over high heat (uncovered), and then cover the pan and remove from the heat. Allow the covered pan to sit for 10 minutes (set a timer) and then strain the water from the pan and run cold water over the eggs. Alternatively, remove the eggs to an ice bath with a slotted spoon. Chill until the eggs are cool enough to handle, and then peel them. I like to use running water to help with the peeling. Have you heard? I recently read that vigorously shaking the cooked, cooled and drained eggs in the pot will allow the shells to effortlessly slip off. Intrigued, I tried this. I stopped shaking when one of my eggs broke in half. Perhaps I interpreted the word “vigorously” too literally! As an option: Years ago, my mom gave me an egg timer in my Christmas stocking. This handy little gadget takes the guesswork out of boiling eggs and can be found in the kitchen goods section of most large grocery stores as well as in some specialty stores or online for five or six dollars. It goes into the pot with the eggs, absorbs the heat just like the eggs do, and indicates when the eggs are cooked to the soft, medium, or hard boiled stage. 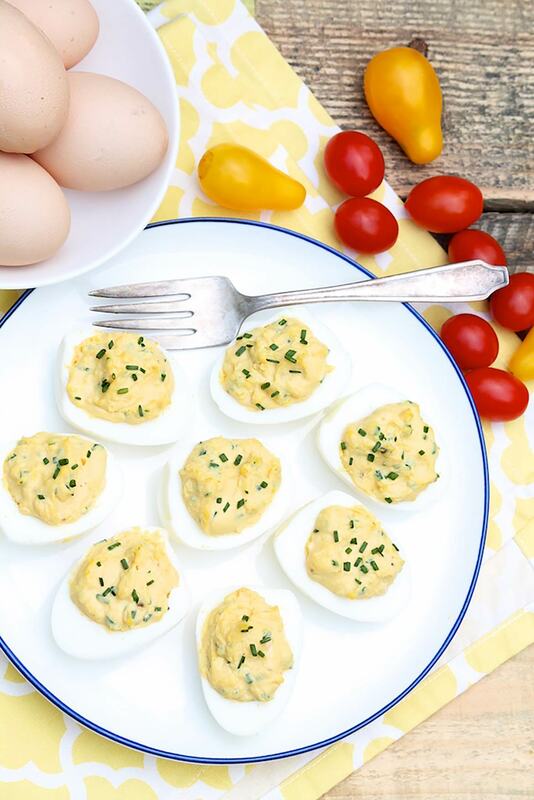 And what better way to use your perfectly boiled eggs than in Classic Deviled Eggs! I’ve found one doesn’t even need to put eggs in water while coming to a boil. 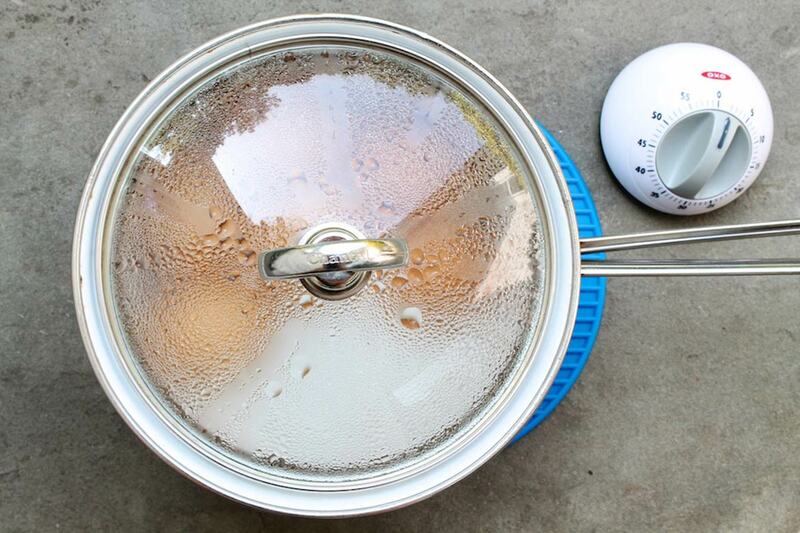 Just boil water w/o eggs, then put eggs in, cover & remove from heat. Wait those 10 minutes & you get the same result. My eggs seem to have a tendency to crack when I do it this way, but I know others who use this method as well. Thanks for your comment, Maya! I find the eggs much easier to peel if I boil the water first and then put the eggs in. No problem peeling eggs laid the same day. Hi Martha, I seem to have more of an issue with cracking when I do this, but thanks for mentioning it as an easy-peel option! I would like to know how to keep the yolks centered in the middle of the egg so that when making deviled eggs you don’t have thin edges that crack. Sometimes they are perfectly centered and sometimes not. Thank you. Great question, Cheryl. I have heard that storing the eggs with the point side down helps with this. That’s what I do and seldom have a problem with really thin whites caused by off-center yolks. If you already do this and still have a problem, try turning the eggs over in the carton the day before (or at least several hours before) you plan to boil them. Lastly, I have read that it can be helpful to gently stir the eggs so that they continually turn over as they begin to set. I hope one of these tips helps! I keep eggs in the fridge, would them being colder than bench kept eggs make a difference to the timing? Cold from the fridge works just fine, Jenny. That’s what I usually do, too. The time it takes for that temperature adjustment is so small and happens as the water is working its way up to a boil, so cold and room temperature eggs can be cooked the same way. Before you boil the eggs, pierce the shell on the larger end. (Remember that because the air is something extra in the egg, it is always in the larger end). I use one of those map tacks or bulletin board tacks, the kind that have a large colored end. Hold the egg in one hand, then with the other hand place the point of the tack firmly against the large end of the egg. While continuing to push the point gently but firmly to the egg, rotate the pin hand back and forth as if turning a key in a lock. Just a few turns will poke a hole in the shell. Then boil the eggs as usual. As the egg cooks, it will expand into the large end of the egg. It won’t ooze out. But it will give you a nicely shaped boiled egg. Thanks for your column. I always enjoy it. Thanks so much for the suggestion, Jan. I have heard a similar tip before but haven’t tried it, figuring I’d probably crunch the eggs! (As an aside, my paternal grandmother used to make pin holes in eggs, blow them out, and then decorate them like the old Ukranian art form.) I’ve always used that hollow spot as a starting point for the peeling process, but you’ve inspired me to try your technique the next time I boil eggs. Hi Ann, I came to your website to have a look at this article about eggs which I find very interesting. I have only one small suggestion which you might find useful. You wrote: ‘carbon dioxide (which is a weak acid)’. This is a bit misleading as carbon dioxide is not an acid. Carbon dioxide (CO2) dissolves in egg white (made of 90 % water H2O) and as a result, weak carbonic acid (H2CO3) is formed. This acid creates lower pH in freshly laid eggs. Hi Izabela, Many thanks for taking the time to share your expertise. The clarification is interesting and much appreciated! I have used this method several times with great results. The eggs are so creamy and delicious. Thank you so much for sharing this recipe. I love how creamy they are, too, Elaine. Thanks for your comment!